Here’s a recipe that’s perfect for both the Fuhrman and McDougall programs. I got it from the Veg-Recipes list, but I’ve adapted it to remove the olive oil that was used to sauté the onion. I also reduced the amount of allspice because I made it as it was listed (1/2 tsp) and it was a little overwhelming. Even with the full amount of allspice, it was very tasty–even my six-year-old liked it, and she claims not to like eggplant. Also, notice that the six servings are appetizer-sized servings. If you’re making it for a main dish, this will be about 3-4 large-sized servings. 1. Preliminaries: If the eggplant skin is not tough, you don’t need to peel it. Cut the eggplant into a 3/4-inch dice. 2. Brown the onions: Heat a large nonstick skillet over a medium flame. Add the onion and sauté 7 minutes, or until the onion starts to turn golden brown. If the onion dries out, add 1 tablespoon water and cover until onions are done. 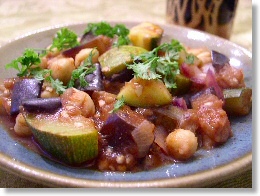 3 .Sauté vegetables: Add eggplant and salt and pepper, if desired. Reduce heat to low, cover and cook 5 minutes, stirring occasionally. Add zucchini, cover and cook an additional 3 minutes. 4. Simmer, season the stew: Add the tomato sauce, garlic, allspice, water and chickpeas. Cover and cook over a low flame 25 minutes, or until eggplant is tender. Add half the parsley and simmer 30 seconds. Taste and adjust seasonings. 5. Presentation: Serve hot, at room temperature or cold. I made this for a Vegan Harvest Dinner — it was a hit! I tripled the recipe and substituted sweet potato for half the eggplant. I have been following the Eat to Live guidelines for a little over a month now. (lost 15 pounds so far!!) This recipe works in very well. I enjoyed it so much I almost felt guilty eating it. 🙂 I didn’t have the AllSpice so I added a sprinkle of cumin. Soo Yummy!